I have a very special guest in the kitchen today, the very talented and incredibly sweet Amy of The Blond Cook. I’ve had the pleasure of getting to know Amy over time and it’s stunning how much we have in common. I’m very sure that if she lived down the street, instead of on the other side of the country, we’d be in each other’s kitchens constantly, cooking and gabbing about food and photography. I was originally drawn to Amy’s site by her recipe for Bacon Horseradish Deviled Eggs and I’ve been a fan ever since. Included in her deep collection of wonderful recipes is a fabulous Beverage section including her creative and super tasty cocktails. 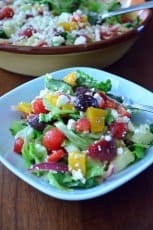 I’m thrilled to have her here today sharing a hearty, comforting recipe that would be a great choice for your next football party or any cool, fall evening. Hello, everyone! 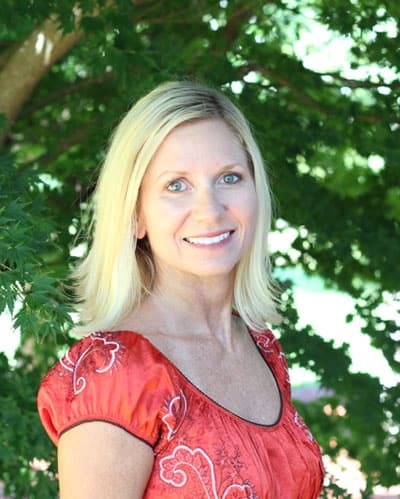 I’m Amy from the blog The Blond Cook. I’m so excited (and honored!) to be guest posting from across the country on one of my very favorite food blogs. I’ve followed Valerie for a long time and always enjoy seeing what she’s cookin’ up in her California kitchen. I’ve yet to meet Valerie, but hope that one day us foodies can cross paths and meet in real life. 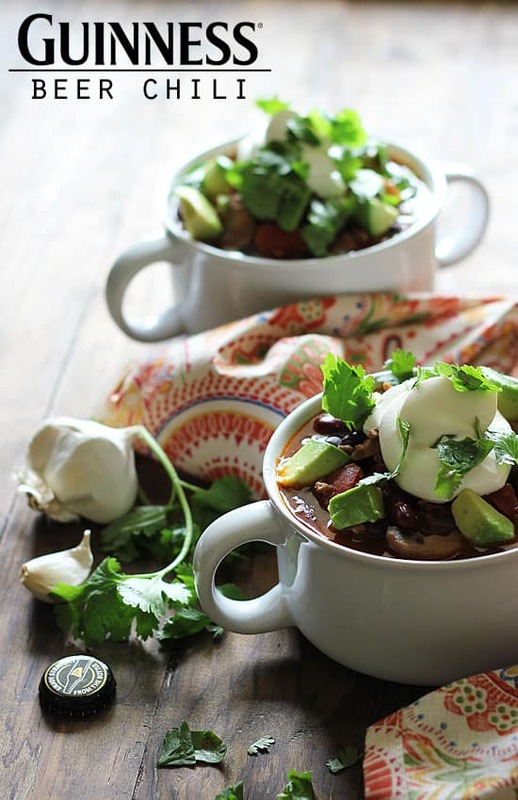 Today I’m sharing with you my new favorite chili recipe: Guinness Beer Chili. What you’ll see on my blog is a little bit of everything. I was a little nervous about doing my first guest post and pondered over what I should make. I mean, I’m taking over someone else’s virtual kitchen for a day… my recipe just has to fabulous! Then I thought, “CHILI”! 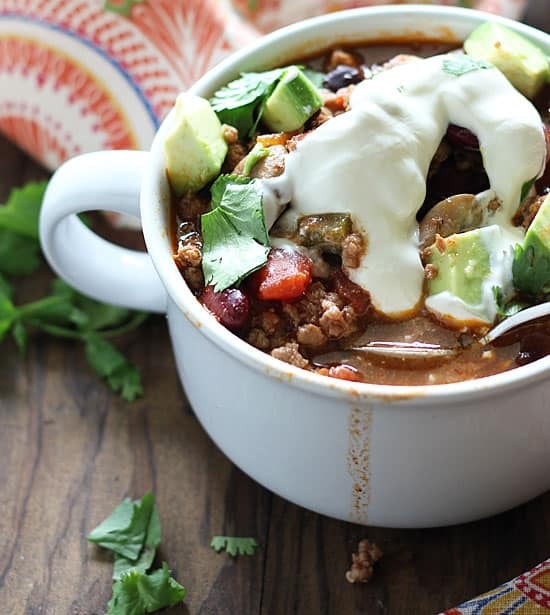 Everyone loves a good bowl of chili, right? 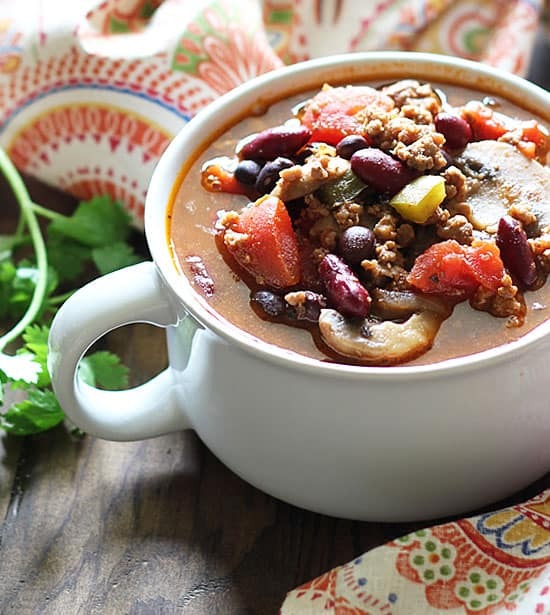 And this isn’t your ordinary chili, either… the full body flavor of Guinness beer transforms it into a rich, comforting bowl of something spectacular. I don’t care if you’re a beer lover or not, you’re gonna dig this chili. TRUST ME. 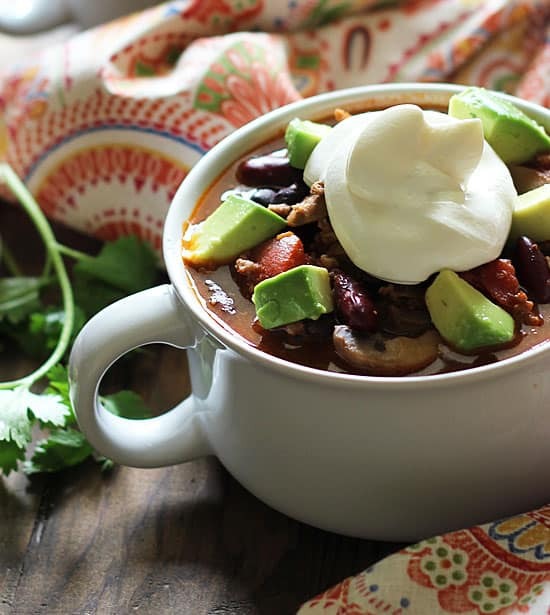 Hearty and chunky, this Guinness Beer Chili is loaded with mushrooms and green peppers. I’m a mushroom lover, so I’ll add them to just about anything I can. If you’re not a fan of mushrooms, just omit them. I also love to top my chili with avocado chunks. And sour cream. LOTS of sour cream. Then I topped this bowl of love with fresh chopped cilantro and dug in. I’m somewhat of a messy eater, can you tell? Valerie, thank you so very much for inviting me into your “virtual kitchen” today, it has truly been a pleasure! Heat olive oil in a large pot over medium high heat. Add onions, green peppers, mushrooms and minced garlic. Sautee about 5 minutes, or until vegetables are tender. Add ground beef and cook until browned, crumbling with your spoon or spatula as it cooks. 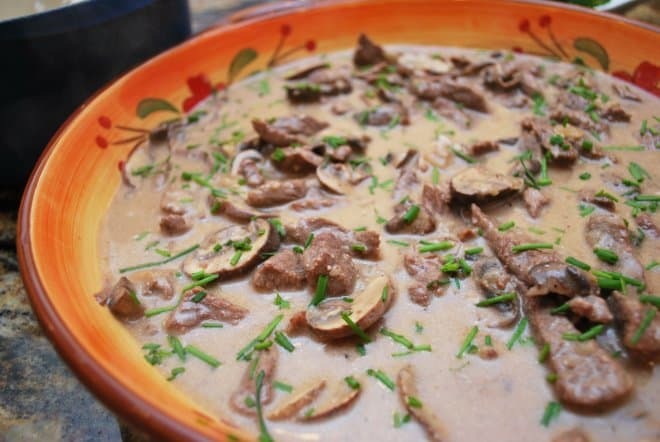 Drain beef mixture in a colander and return to pot. Add cayenne pepper, crushed red pepper, oregano and chili powder, salt and pepper. Stir well to combine. Add diced tomatoes, kidney beans, tomato sauce, beer and brown sugar. Bring just to boiling, reduce heat and simmer (covered) for 1 hour. Follow Amy – she’s everywhere! I agree completely Nic! Gorgeous photos! OH-MY-GUINESS!!!! My hubby would FLIP for this. He loves chili & Guiness. You are very talented, Amy. 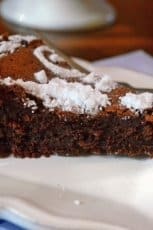 Not only with your recipe, but your photography. Thank you for this awesome recipe, girls!! You crack me up, Miss Julie 🙂 I know my husband is going to love this one too. Can’t wait to make it! This chili with the Guinness in it sounds wonderful. The photos are amazing! Pefect pick for a first guest post! This bowl of chili looks amazing! Beautiful dish, Amy and what a great guest post to have on your blog Valerie. LOVE the addition of avocados, and sour cream, and beer! Thanks, Sandra. 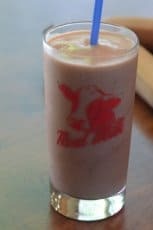 It is one fabulous list of ingredients..for sure! 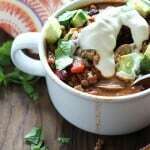 I’ve used Guinness in lots of things, but never thought to add it to chili!! What a great idea. 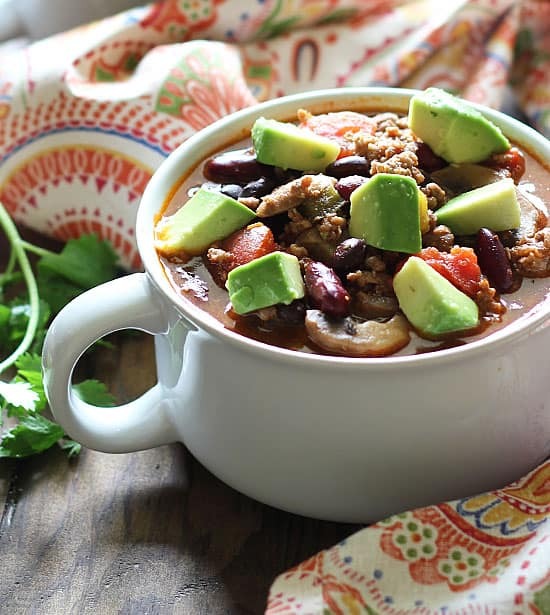 I love everything in this chili, Amy, and your pictures are gorgeous!! Thanks for sharing!